France and Armenia have signed deals on tourism investment and university cooperation, as French President Hollande renews diplomatic efforts in the Caucasus region. PARIS: France and Armenia have signed deals on tourism investment and university cooperation, as French President Francois Hollande renews diplomatic efforts in the Caucasus region. 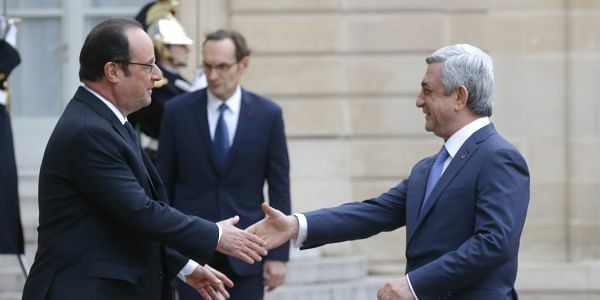 Hollande, meeting in Paris on Wednesday with Armenian President Serzh Sargsyan, discussed efforts to settle the 23-year-old conflict with Azerbaijan over the mountain enclave of Nagorno-Karabakh. He said "we want to work and find solutions" to avoid a repeat of recent violence. Last week fighting killed 5 Azeri soldiers and one Armenian soldier. France, Russia and the United States have been trying to mediate the conflict for years. Hollande's administration hopes his effort will continue after he leaves office in May. French and Armenian officials signed three agreements Wednesday: on easing tourism between their countries, research cooperation and creating a French university in Armenia.